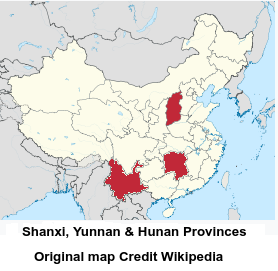 Reports of African Swine Fever continue to come in to China's Ministry of Agriculture, with the southern provinces of Yunnan and Hunan, and Shanxi province in the north, all reporting new outbreaks today. As noted on Sunday, there have been some delays in confirming and reporting outbreaks from Hunan province, which is a concern as it is one of China's biggest pork producers. While reports have (at least temporarily) ceased from some of the earliest hit provinces, ASF has spread to 4 new provinces over the past 14 days (Shanxi, Yunnan, Hunan & Guizhou), suggesting the virus is more widespread than is currently being reported. The Information Office of the Ministry of Agriculture and Rural Affairs was released on October 30, and an African swine fever epidemic occurred in Yangqu County of Shanxi Province, Fuling County of Hunan Province and Simao District of Pu'er City of Yunnan Province. At 12 o'clock on October 30, the Ministry of Agriculture and Rural Areas received a report from the China Animal Disease Prevention and Control Center and was diagnosed by the China Center for Animal Health and Epidemiology (National Center for Animal Disease Research), a farmer in Yangqu County, Taiyuan City, Shanxi Province. 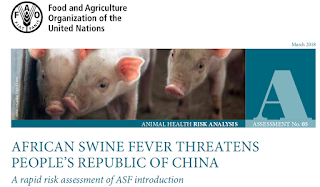 A farmer in Fuling County, Huaihua City, Hunan Province, and a farmer in Simao District, Pu'er City, Yunnan Province, each had an African swine fever epidemic. Up to now, there are 210 live pigs in Yangqu County, Taiyuan City, Shanxi Province, with 75 heads and 47 deaths. Pu'er County, Yunnan Province There are 36 pigs in the city of Simao District, with 5 heads and 1 death. Immediately after the outbreak, the Ministry of Agriculture and Rural Affairs sent a steering group to the local area. The local government has started the emergency response mechanism as required, and adopted measures such as blockade, culling, harmless treatment, disinfection, etc., to treat all the sick and culled pigs harmlessly. At the same time, all pigs and their products are prohibited from being transferred out of the blockade, and pigs are prohibited from being transported into the blockade. At present, the above epidemic has been effectively disposed of.